Does your company participate in trade shows? If so, you’ve probably developed a system to book, exhibit, and market at these shows in hopes of gaining new leads. Trade shows can be expensive for companies and we often hear from clients that they wish they could do more with the leads especially considering how much each lead costs. The answer to this? Utilize inbound marketing strategies when preparing for your upcoming trade show! To truly maximize the ROI you see from leads generated at trade shows, planning must begin 6 months to a year before your actual attendance at the show. This time frame will allow you to develop goals for your show and then create a marketing strategy around accomplishing those goals. 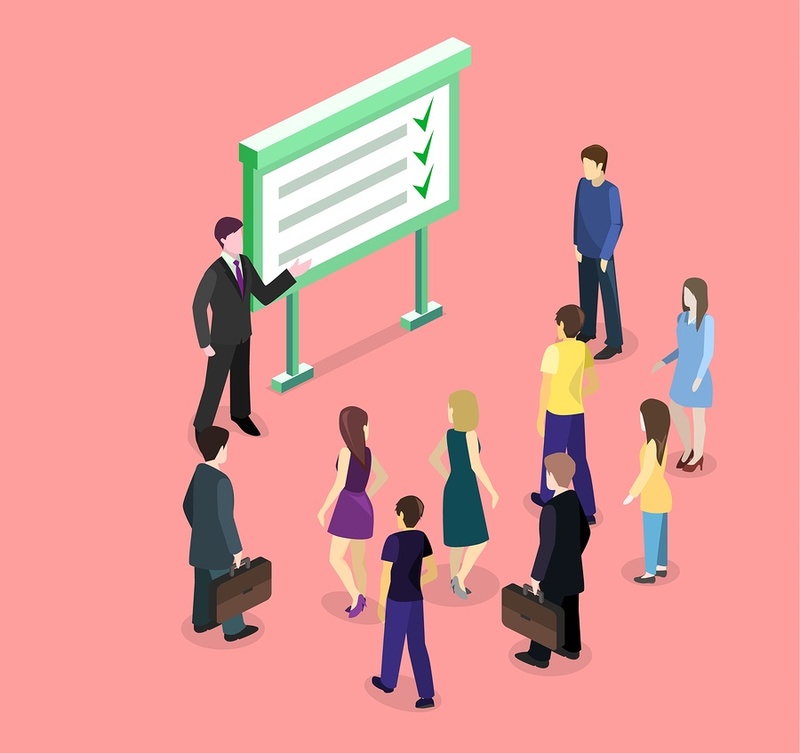 While there are many administrative elements that go into planning a trade show, this blog will cover how to create a marketing strategy for the show and the preparations that go into this strategy during months 12 through 4. Most companies who attend trade shows go into the show hoping to gain new leads. After all, you aren’t attending the show just for fun - you need to see a return on the money spent to get there. The best way to start out planning your marketing strategy for a trade show is to develop a specific and attainable goal you wish to accomplish with your attendance. Once you have a specific goal in mind for your leads, you have a much better chance of following up with them after the show and actually seeing a ROI on theses leads. Once you have set your goal for your show, do some research to determine which shows will match your pre-determined marketing strategy and goals. Research prior years of the show, see what types of companies and people typically attend and determine if they will fit or help you accomplish your goals. You may even want to create a buyer persona to determine who your target audience is for each trade show. Once you find a show that works, book it! Download our Buyer Persona template here to create a persona for your upcoming trade show! By further defining your goal for the trade show, you can now work towards creating marketing materials that will help you accomplish your specific goal in the time frame you set for the trade show. After you’ve developed your goal into a SMART goal, you can then work on creating the materials you will need to accomplish this goal at your upcoming trade show. Using the example of increasing your email list, you will want all of your materials and offers to have the end result of obtaining a lead’s email address to add them to your list. Create a contest or giveaway for your trade show. To enter, visitors to your booth must fill out a form on a landing page, which will ask them for their email address. Create an informational offer, such as an e-book or video series, that will provide value to your booth visitors. To download this offer, visitors must fill out a form and provide their email address. Instead of offering pens with your company name, consider offering objects you can place a QR code or memorable URL on such as a magnet or a sticker. Ask a fun industry trivia question and provide the answer by having the visitor scan the QR code. Once they are on your landing page from the QR code or URL, offer a subscription to your email newsletter. This way, even your promotional materials will lead your visitors towards your goal of receiving email addresses. While your goal doesn’t have to be gaining email addresses, the above examples show how you should consider your overall show goal when developing each and every piece of marketing and promotional materials for your trade show. One of the best ways to spread the word about your presence at the trade show is to invite the people you already know. Take a look at your contacts currently in your CRM; are they close by? If so, invite them! Let them know about the trade show, what booth you will be at, and tell them you plan on making them a special offer at the trade show. Another way to let your current contacts know about your upcoming trade show is to utilize your social media presence. Promote on your social media channels that you will be there and will be making special offers to current social followers. If there is a hashtag or other specific tag for the event you will be attending, use it in all your social media promotions. This will ensure that not only your current followers see your posts, but anyone who is interested in the trade show will see the post as well. Use this time to ensure that your website is set up to help you meet your goal for the trade show. When you are creating your marketing and promotional materials for the show, don’t forget the one you already have in place - your own website. Ensuring that your landing pages you create for the show match the rest of your site. If you link to other places on your site on the landing page, be sure the links work and lead to the correct place. If you have an product catalog, be sure it is digital and visible on your site. Thumbing through a printed catalog might be time consuming if you have a large number of SKUS and products. If your website is setup correctly then you can instead have a tablet that will allow your sales people to easily and quickly show your booth visitors the products they are interested in. Websites take some time to tweak and you want to give yourself plenty of wiggle room for any redesign you may need for the trade show. Take a look at this early on in the planning process so you are ready to put your best foot forward, so to speak, come trade show day. Trade shows are a large investment for companies, both in time and in resources. You want to ensure you are getting the most out of both, so take the time to plan out an inbound marketing strategy early. Determine your goals and then build your strategy so that every action you take at the show leads you towards accomplishing that goal. By starting to plan at least 6 months to a year ahead of your trade show, you will give yourself plenty of time to develop a solid inbound marketing strategy for your trade show that will allow your to see the maximum ROI on your new leads! All trade show prep begins with the creation of a SMART goal to accomplish during the show. Download our free Goal Sheet template to get started developing your own.